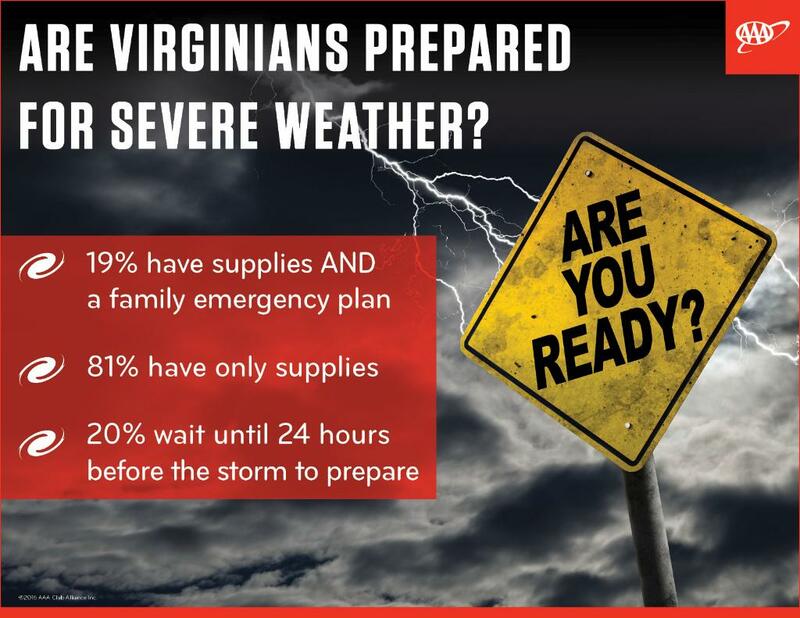 Fewer than one in five (only 19 percent) of Virginia respondents and just 18 percent of Maryland respondents said their storm preparations include securing adequate supplies like food, water and batteries, but also a family emergency plan. Driving through flooded roadways is an extremely dangerous behavior, yet alarmingly, four in ten (41 percent) of drivers in Virginia and more than a third (38 percent) of drivers in Maryland report having done so in the past. Although people living in the “Deep South and near the Gulf Coast are those most vulnerable to hurricanes,” Virginia experienced 12 direct hits from major hurricanes in the period from 1851 to 2004, according to an analysis by the National Hurricane Center. Meanwhile, Maryland was impacted by two direct strikes by the deadliest, costliest and most intense hurricanes on the United States mainland in the period from 1851 to 2004. Since then, both states have been impacted by major tropical storms or hurricanes that resulted in heavy flooding. Such systems can also spawn smaller and localized weather-related ruins. Virginians and Marylanders are fairly divided when it comes to fears of flood damage to their property, the AAA Mid-Atlantic survey* found. Fifty-six percent of Virginia respondents said they were not at all concerned about residential damage while 13 percent said they were very concerned and 29 percent said they were somewhat concerned. Similarly, 50 percent of Marylanders said they were not at all concerned about residential damage while 14 percent said they were very concerned and 36 percent said they were somewhat concerned. That’s the case although “flooding is the most common and costly natural disaster in the United States, causing billions in economic losses each year.” Currently, there are only about 660,000 flood insurance policies in force in Virginia and around 267,990 flood insurance policies were in force in Maryland in 2011. Knowledge of flood insurance requirements among residents of the Commonwealth of Virginia and the state of Maryland is strong, according to the AAA survey. Eighty-two percent of Virginians and 80 percent of Marylanders surveyed said they are aware that homeowner’s or renter’s insurance does not cover weather-related flood damage. A separate flood insurance policy is required and a 30-day waiting period is mandatory before it takes effect. Ironically, Virginia was by another hurricane named “Gaston,” which struck August 30, 2004, notes the Virginia Department of Emergency Management. That “Gaston” caused nine fatalities and destroyed or damaged 5,798 homes, 2,077 vehicles, and 97 businesses. It was one of the five worst storms in Virginia history. It dropped 10-12 inches of water in Richmond and caused $130 million in damage. A year later Virginia was directly impacted by Tropical Depression Ernesto on August 29, 2006, that resulted in seven fatalities, $118 million in total damages (not including economic losses), and 609 homes that were either destroyed or damaged. Since 2004, Maryland has been impacted the remnants of Hurricane Cindy, Hurricane Dennis, Tropical Storm Tammy, Subtropical Depression Twenty-Two, Tropical Storm Alberto, Hurricane Ernesto, and Ocean City was evacuated prior to the landfall of Hurricane Sandy in 2012. The National Hurricane Center, predicts the Atlantic hurricane season will be the most active since 2012. Stock Emergency Supplies – Plan for a week’s worth of non-perishable food and water. Be sure to have flashlights, extra batteries, battery-powered radio, medications, first aid kit, blankets, toiletries, diapers, etc. You may also want to prepare a portable kit and keep it in your car should you evacuate. Check Your Vehicle: Make sure your vehicle has a full tank of gas, properly inflated tires and ensure your wiper blades are not leaving streaks. Have your vehicle inspected by a certified mechanic to determine if the brakes, fluid levels, air conditioning and belts are in good working condition. * The poll was conducted by Public Policy Polling between August 19-21, 2016 and has a margin of error of +/- four percent.